Þal is a folkloric, traditional rug. With its warm, vivid, passionate colours it is the reflection of a regional culture. Emotions which are composed with the rich green of the region, bright yellow of the sun, and other vivid colours like blue, maroon, orange, red are used together with human and animal patterns on the rug. The designs and also special local yarn with long fibers of Sivas region is used for this production. The designs have distinctive lines, harmony and also easy flowing patterns and they are often used at textile sector for fashion products. Bright and powerful colours give a strong and warm character to the rug. 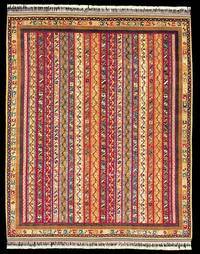 Various fringe weavings, and washing processes help these rugs to be even more distinctive.